The Woodhaven Residents' Block Association will feature two sets of guest speakers at its next Town Hall, on Thursday, September 18. The first is Deputy Inspector Henry Sautner, the commanding officer of the 102nd Precinct, who will introduce a new Community Affairs officer to Woodhaven. The second are representatives from HeartShare Human Services of New York, an organization that has opened a new group residence in Woodhaven. Deputy Inspector Sautner, who is in regular touch with the Block Association's leadership, will be attending his first WRBA Town Hall of the year. This will be an excellent opportunity for Woodhaven residents to ask questions and find out about policing issues affecting our community. Deputy Inspector Sautner will be accompanied by Officer Jose Severino, a regular attendee of WRBA meetings, and a new Community Affairs officer who will replace Officer Brendan Noonan, who was transferred. 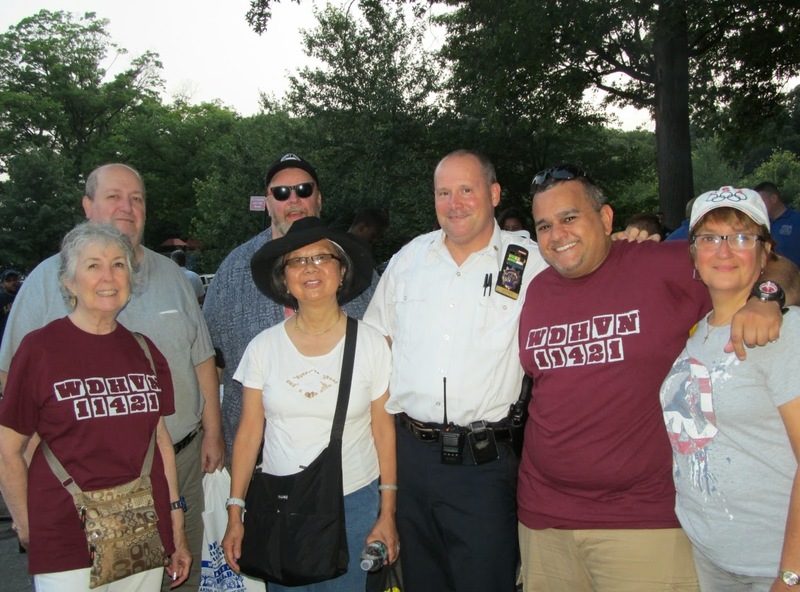 Deputy Inspector Sautner at the 2014 Night Out Against Crime. HeartShare will also be attending their first WRBA Town Hall of the year. The nonprofit had attended a Block Association meeting back in 2012 to answer questions about a new residence they were planning to build at the northwest corner of Woodhaven Boulevard and 89th Avenue. The home is now nearing completion and is expected to open this month. It will house 10 developmentally disabled people. Four WRBA Directors recently toured the home and were impressed by it. "We try to make all our Town Halls useful and enlightening. But with Deputy Inspector Sautner and HeartShare in attendance next week, this Town Hall should be even more informative than usual," said WRBA President Martin Colberg. "Crime and policing are constantly on the minds of our residents. And the HeartShare residence, which is located in the middle of our neighborhood, has been the subject of many rumors, some of them misinformed. This is a chance to find out what's really going on in Woodhaven." The Block Association will also provide an update on our graffiti clean-up program. We recently achieved our goal of painting every single tagged mailbox in Woodhaven this season. The September 18th Town Hall will begin at 7 p.m. and will be held at the American Legion Hall (89-02 91st Street).